Hi Honey Stamplings, I'm home! Did you miss me? Did the dog run away trying to find me and the cat go up a tree? I squired Hammy away with me in the suitcase and we had a blast while we were away! Wait. What? I wasn't in the suitcase, he was! More reunion talk below, but for those who just want to see cards in this space, I have a couple that I made before I left which I didn't have time to post. This old gas bag is no doubt known to a lot of you and I never tire of her! I used to draw a ciggie in her hand, but that's so last century and no longer acceptable. When I recently got the NBUS sediment from Verses Rubber Stamps, I immediately thought it would be perfect for her. I meant to add some clouds, but I, well, I forgot. CAS Mix Up Challenge: Watercolour wash (sky and lawn) + stamping + die cutting (scalloped border). Double D Challenges: Sentiments/Quotes. They can be silly, right? Retro Rubber: Anything goes. I've been stamping this lovely lay-about lady laying out for years and years. She is a vo stamp from Art Impressions. Stamp Ink Paper: Watercolor. In addition to the background washes, I watercolored the image with my Ziggies. The jewel-toned background of this card was in my UCB box. I made it ages ago by smearing my Ziggies onto an acrylic block, spritzing it with water, and then stamping it onto paper. I actually still have a few of these spritzed arty backgrounds in the box. When I saw the challenge at Just Us Girls (which I missed, darn it) was "Block Watercolor Stamping," I pulled this background out and attached it to a coordinating colored card base. Now what? I turned and whistled over my shoulder for Hammy, who was busy in the neighbor's fig tree. (Figs are like crack for the field mice, roof rats, raccoons, and little domesticated hamsters in the neighborhood!) With the promise that he could go right back to stuffing his face, Hammy cleaned himself off in the birdbath and sat on the window sill to see what my panic was. He is so great at remembering the challenges, he immediately told me to add a silhouette. The NBUS silhouette die I chose was "Princess Dress" from Memory Box. As my friend Lolly says, silhouettes can be any color, but for this background, I felt black was best. The NBUS sediment is from Paper Smooches. CAS Watercolour Card Challenge. Silhouette. 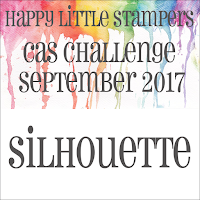 Happy Little Stampers CAS Challenge. Silhouette. One of the many pleasant experiences of my trip back to the Midwest was meeting my bloggie friend, Pat McCleary. 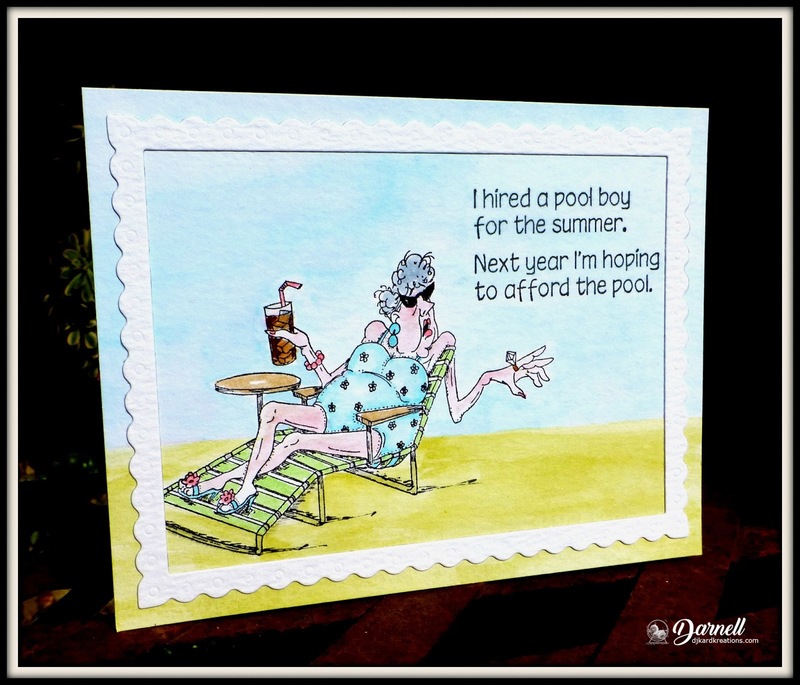 Pat is a lovely lady who makes beautiful cards, but she doesn't have a blog to share them. I found out she was a fan when she sent me a complimentary email in 2013 telling me how much my blog brightened her day. Well that made MY day! I feel blessed to have finally been able to meet her on this trip! We all have silent friends out there reading our blogs who we don't know about because they either don't follow us or don't have blogs of their own. I haven't said so in too long: to all of you silent supporters, thank you very much! I only have a couple of photos of me at the reunion because I was busy taking photos. Here is a group photo of all of us. I'm over on the right. That's Glenda on the left and Mary Beth on the right. I made the photo black and white because I couldn't figure out why the color photo gave us all neon green hair! And, yes, for the eagle-eyed among you, the buttons Glenda and I are wearing are made from our senior class photos. Fun idea! I'm going to sleep for two days and then I'll be back on Sunday for opening day of NBUS Challenge #12! See you then! Two awesome cards, my friend. LOVE the watercolour wash background behind the old bitty!! So funny ... and PERFECT sentiment! Made me laugh! And LOVE that silhouette card. 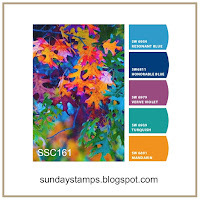 Your bright mix of colours from your acrylic block stamping are SO PRETTY!! The little black dress is perfect! Great pictures from your reunion. Sounds like you had a wonderful time. And what a treat to meet a friend who follows your blog. A big highlight for both of you, I'm sure. Glad you're home safe & sound! How fun to go the reunion--forgot that's what you were doing. Great pictures--the 3 of you look fabulous! So neat to meet another blogging friend & you are both so photogenic! Great cards--love them both, but the first one really made me laugh! Brilliant cards, and that sentiment! The kind of thing you don't use often but when you do, nothing else will fit the bill. Wonderful cards and fabulous photos of you all! That old gal (Edna, I think from memory) is a hoot and she is one of my oldest stamps. The sentiment is perfect for her! Hi Darnell, Glad you had such a good tri-p. Always nice to catch up with friends. Loving the cards. T^hose old lady ones do make me chuckle. A lovely post today Darnell, so pleased you had a wonderful trip, catching up with old friends! I love the black and white photo of you three lovely ladies! What a wonderful pair of cards Darnell - so glad Hammy could rescue you (again?). I think I almost enjoy your commentary as much as your cards. What a wonderful time you look to have had - always a great feeling catching up with old friends! Two perfectly SPLENDID cards shared with us today. I'm sure your blog posts brighten the day of everyone who stops by, I certainly enjoy visiting with you through the ether! Looks like you have enjoyed your reunion (hope Hammy wasn't too squished in the suitcase with you!) and TFS the pix. Hahahahaha!!!!! Oh my gosh Darnell, this is just hilarious, what a wonderful image and sentiment to match. You made me LOL at 4:30 am. right now, thank you for that and for sharing this fabulous card with us at RETRO RUBBER, hope you play again next time. Love both of your cards especially the first one!! Looks like you had a fun time on your trip! Two great cards! I giggled at the first one. I can totally see her with the other item, too. You colored this card wonderfully. The second card is equally nice with the watercolor looking background and pretty dress silhouette. Snazzy is right. So glad you got to meet your bloggy friend. She looks lovely. Also very happy you enjoyed your reunion, too and that you got to meet up with those two dear friends of yours! Thanks so much for sharing! I hope you have a marvelous weekend! Hugs! Both cards are brilliant but the one with the old gal made me burst out laughing and luckily the coffee didn't come out of my nose! Your reunion looks like you had a great time! I'm so glad you had fun and so glad you're back. I definitely missed you and your posts. I had to laugh at the first post. Who needs a pool when they've got a pool boy??! I've been meaning to try the block background technique. I love that dress. I can't wait for the NBUS Challenge. That golden oldie card is super with that quote! And I love the brightness of the bold colours on your twoofer! That first card cracks me up! Hammy had a great idea to add a silhouette to that background. What fun to catch up with friends from long ago. You had a wonderful turn out for the reunion. It is fun to meet other bloggers in person and I'm glad you were able to meet Pat. See you at NBUS. Fantastic humorous card that you linked to Retro Rubber! Love that "lady"! Also enjoyed the second card with the color blocking! Glad you had a great time at your reunion. Thanks for sharing your cards with Retro Rubber. Hope to see you in our gallery in future challenges! A pool boy? I want one *grin* Your 'old gal' is sheer delight! Poised and 'with attitude'...love the big ring, too! Your dress: yes, totally snazzy; totally classy! And speaking of 'classy': how fabulous your reunion photos of all the gorgeous gals and handsome guys! Looks like you and your friends had a jolly time, reconnecting and getting into all kinds of shenanigans over the duration of your visit. Enjoy your rest; I'm anticipating a bursting at the seams gallery for the upcoming NBUS. Heaven knows I have my fair share! Glad you're home, safe and smiling! I'm back...so bedazzled with your post I forgot to add a big thank you for sharing your little black dress in the HLS CAS challenge! Ah ah ah love your fun card!! Really humorous! And the second one looks wonderfully with that background and the dress silouette! Seems you have a lot of crafty friends, such a great reunion!! Surely we all have enjoyed it!! It appears you and Hammy, the official mascot, thoroughly enjoyed your reunion. At least, that's how the pictures depict the event. And you even came back with some awesome mojo to share. That old hag is always a pleasure to behold. You can almost hear her raspy voice talking about her pool boy. I'm still giggling about this old harridan. And look at you creating the perfect, snazzy LBD...on the perfect background. Think you're definitely on a roll. i think you've got a winner there. I always love seeing your cards, Darnell! I can't really add anything unique in my comment but can only say LOL! Thank you for playing with us at Retro Rubber and hope you will be able to join us again soon. Missed you a lot (and missed blogland) whilst trying to be Presidential! Home for a few days then off Saturday to the European Championships.... it's all go! These are 2 great cards - like the silhouette one but the old biddy really rocks my boat! Love it. LOL ... oh yes, silly is acceptable and especially from you my friend! This card is a hoot ... love it! You always know how to lift my spirits! 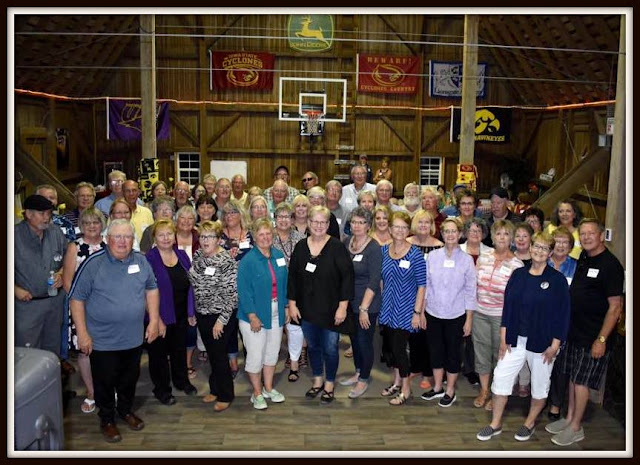 Looks like a good time at your reunion! That's awesome! Thanks so much for joining in the fun at our Double D ‘Sentiments & Quotes’ challenge! We hope you’ll come back often. Your lounging lady is wonderful! Old as she may be, I've not seen her before. Superb colouring and I love the frame you've put around her. I just cannot believe that the sentiment did not come with her - it's like they're married, they're so perfect for each other. Thank you for cheering my day and joining in with us at Retro Rubber Challenge again. The term 'gas bag' made me laugh as much as the card, D.!!! OH my gosh, I am NOT familiar - yes, me, under giant rock! Another wonderful post... you look wonderful, btw! Wonderful sense of humor :-) I love your distance to passing time. But if it looks like you, then time does not matter the least, Darnell. I love your two cards, your watercolor techniques are great every day. It is nice to meet friends, such meetings are a small trip in time, for some it is very refreshing :-)) But I am glad you have returned home happily. Now you will be more frequent in blogland. Brilliant first card, fab, funny image and a great sentiment. A very snazzy second card too. Glad you enjoyed your break and really great photo's. Welcome home and glad the reunion was a success. Is it me or do the men look older than the women? Fun cards. The ziggies background I will give that a try. Looking forward to the next challenge. Fab cards Darnell, the first one is too fun and the second one is so sophisticated and fun also. Glad you had a great reunion! That lady is a hoot, Darnell, and so well colored. Every one needs a little black dress including the silhouette challenges. I'm glad you had such a great time at your reunion. I always find ours fun. What a fun card and cute sentiment on the first one. It made me chuckle. Love the snazzy card with the dress. Glad you enjoyed your high school reunion. I know you had a lot of un and it is always nice to see old friends. We use our high school photo on our name badges also at our big reunions every 5 years. Looking forward to your NBUS challenge. I love the cards.the first one made me chuckle. Looks like you had a fun time. Love your cards Darnell! Glad you had a nice time at your reunion! Awesome cards. Pretty funny sentiment on the first card. The 2nd card had to have the little black dress. Very cute. Looks like you had a blast at your reunion. Love both of your cards, Darnell. Meeting your friend who follows your blog is like meeting a pen pal ... how fun. Hugs! I'm still laughing at the first card! So fun and perfect with that sentiment! And the little black dress is perfect on the bright and artsy block background! I'm glad you had a safe trip and a good time at your reunion and meeting an online friend is such a special time! Rest well. I have some NBUS!!!! Oops! Got so excited about using some NBUS that I forgot to say thanks for sharing with us at CAS Mix Up and CAS Watercolour! Awesome cards, Darnell. That first one with the beautiful wash background made me laugh. And your second card is so snazzy and cute. I have a bunch of those block acrylic backgrounds in my stash too. Haha - the pool boy made me laugh! HA, that gas bag is a HOOT and the sentiment goes with her perfectly!! FUN FUN card Darnell! The second has a terrific artist look to it. Your story of Hammy gave me a big smile. You should write a book about his adventures!! Just think, you two could travel the US doing book signings and meet all kinds of blogging friends!! Thanks for sharing the photos, you look fabulous!! Funny gal and I love that snazzy background Darnell! Were you by any chance in Iowa? Thinking I've met Pat too, in Cedar Rapids? Stampers... hehe Fun to see what you've been up to! I want a pool boy of my own! Awesome card and wonderful water coloring. Glad to see you had fun at your reunion. I hope your NBUS challenge runs for awhile - leaving for a week to AK on business. Hope to participate when I get back. Darnell I am one of those persons who always smiles on reading your posts...I dont know how you do it each and every time.....you must be such a happy person too!! PS: If you ever plan to come to India...do come to Bangalore...I would simply love to meet you and host you too!! How fabulous that you were able to attend your reunion and have a wonderful time, with even Hammie behaving himself! Love your cards, the first one is pure genius! Great cards but the first one is hilarious. Your reunion photos are fab. Always a joy to meet old friends, even with neon hair. You are looking very well and happy. Great cards to share after you and hammy rocked out at your reunion! Her blue hair would have coordinated well with your neon green locks in the photo...but we'll just have to imagine it for now. HOW did you color that glass of cola (with or a shot of rum added) to look so realistic? I'm thinking that I may have to get some Zig markers if they look this amazing. Your little black dress card is just right. Just the right amount of color and just the right image and sentiment. Love it! We're all glad to have you back and still in one piece. Say hi to Hammy! What a fun stamped image that makes you smile. 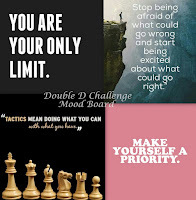 Thanks for sharing with us at Double D Challenge Blog.Hope you will join us often. Absolutely fabulous cards Darnell, especially the first one, she is just my type of gal. 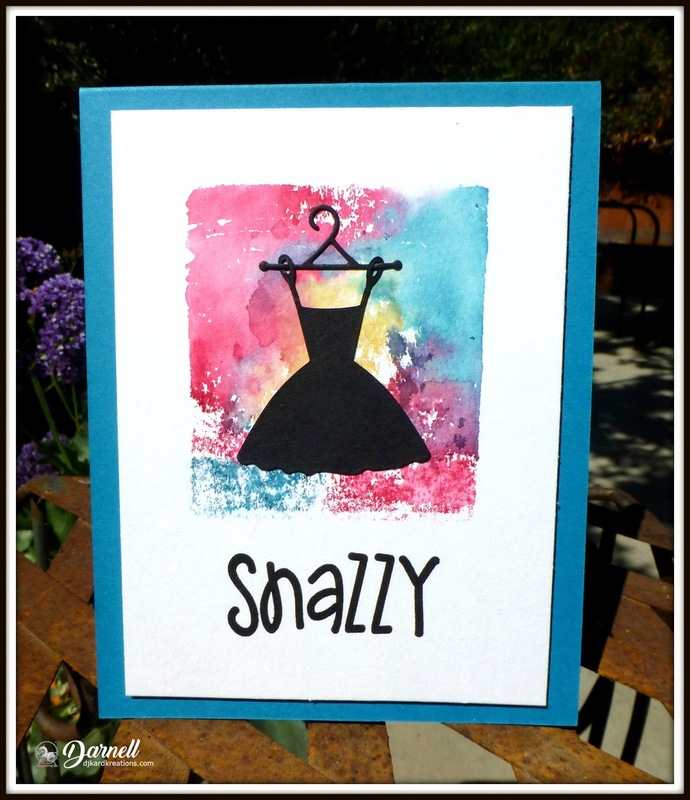 Love your colours on the little black dress card. What a fun one that first card is! Great watercolored background, too! The little black dress really pops on the colorful background! Perfect! Glad to hear you had fun at your reunion and made it back safely! Hahahahaha! Your first card is a hoot! LOVE those AI stamps! And what is more classic than a little black dress? What a fun sentiment to have, too. Looks like you had another nice trip! Gees...forgot to mention...Thank you, thank you for sharing your reunion photos. You look Great..by the way!!! Looked and could not find hammy..was probably hiding because of all the noisy giggling going on..lol!! Oh how funny is your first card! And the silhouette is fabulous! You are the Ziggie Master~great backgrounds, Darnell. Bet you had a blast at your reunion~very nice photos. As always, my friend, you made also my day! I'm a little late by visiting you, but it does not matter. :-) I have to laugh when I saw the first card. Wonderful combined the motive and sediment. I also like the little black one and the background. Love the sentiment and the lady...so funny. YOur dress really pops against that lovely backdrop. So glad you had a good t8ime at you reunion. Welcome home. Pool boy, school boy...I'd like to hire one of those young, scantily clad male housecleaners. And I'd actually be upstairs taking a nap while he cleaned. :) Your cards are awesome. And bless Hammy for his design sense. Such a fun image and I love the sentiment! Thanks for sharing with us at Double "D" Challenge. Popping in to say, "I told you so". The little black dress was as well received at Happy Little Stampers as it was in my little craft room. Congrats.